There have been many debates in recent years having to do with snake lights. In the past, we used the same lighting set-ups for snakes as we did other reptiles, but now we know some kinds of lighting elements are not necessary for most kinds of pet snakes, including ball pythons. With the exception of some uncommon pet snakes, UVB lighting is unnecessary for snakes. Will it hurt? No, and it may also increase their activity and/or coloration, but ball pythons and most other pet snakes can be perfectly healthy without the aid of UVB lighting. If you do decide to offer UVB lighting make sure the bulb is about 10-12 inches away from your snake and change it out every six months, even though it still appears to be working. UVB is an invisible spectrum of light and will expire before the visible spectrum runs out. Therefore, the bulbs don't typically last longer than six months unless the packaging notes that further testing has proved otherwise. Depending on your house temperature, you may or may not need heat lights to maintain appropriate temperatures inside your ball python's enclosure. Ball pythons need a basking spot of about 90 degrees and an ambient temperature in the low 80's. You should have a thermometer on each end of the tank so that you can properly monitor the thermal gradient. Some household light bulbs will emit enough heat to heat a tank, but if your tank is larger, you will need some heat lights. Many snake owners use under tank heating pads to keep the tank warm but it can be difficult to maintain and monitor proper temperatures with heating pads. Heat lights offer a more natural day/night cycle for your pet snake than heating pads. You can have two separate heat lights, each on a 12-hour cycle. Leave the daylight heat light on during the day and turn the "night-glo" or nocturnal red light on at night. This will simulate a natural day/night cycle and help to keep your snake from getting stressed. Incandescent heat bulbs come in a variety of wattages to allow you to provide your enclosure with the proper temperatures. The smaller the tank, the lower the wattage that is needed. 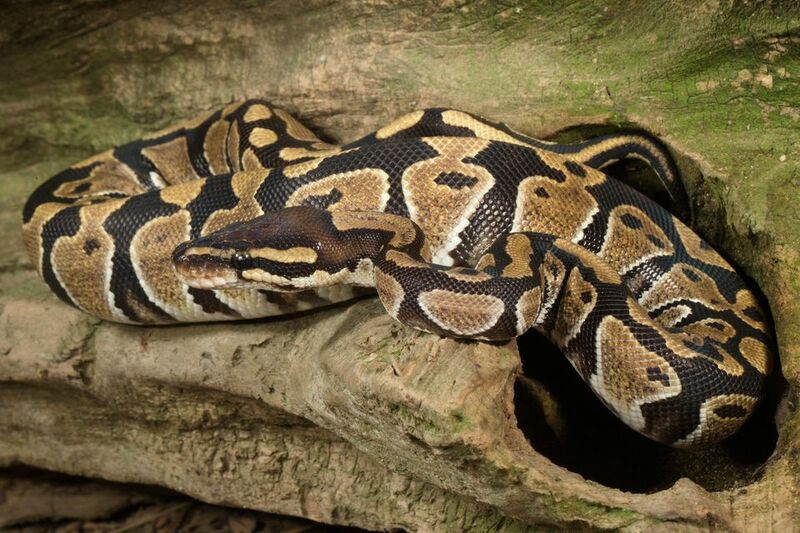 You wouldn't want to put a ball python in a 10-gallon tank with a 150-watt bulb. It would get much too warm in the enclosure. Be sure to place the heat bulb in a heat lamp with a ceramic or porcelain socket, not just a work light from the garage, and use a secure metal mesh screen top to keep your snake from escaping and burning himself on the hot lights.